هدف این پژوهش توسعه کامپوزیت‌های زمینه پلیمری رسانا می باشد به‌طوری‌که مقدار این رسانایی بالاتر از حد استاندارد موسسه انرژی آمریکا باشد. در این صورت کامپوزیت‌های توسعه داده شده می‌توانند در ساخت الکترودها مورد استفاده قرار بگیرند. بدین منظور ذرات هادی دوده، نانولوله کربنی و گرافیت منبسط‌شده با درصدهای وزنی مختلف (5، 10، 15، 20، 25، 35 درصد ) به رزین اپوکسی اضافه شده و هدایت الکتریکی نمونه‌ها مطابق استاندارد روش چهار نقطه‌ای اندازه‌گیری شده است. متوسط آستانه تراوایی الکتریکی برای پلیمرهای حاوی ذرات دوده، نانو لوله کربنی و گرافیت منبسط شده به ترتیب 25، 10 و15 درصد وزنی بدست آمده است. همچنین تأثیر پارامترهای مختلف ساخت ازجمله استفاده از پمپ خلأ و گرمادهی روی هدایت الکتریکی نمونه های کامپوزیتی مورد بررسی قرار گرفت. آزمایش‌ها نشان دادند استفاده از پمپ خلاء هدایتی الکتریکی را به ترتیب 10.8 ، 11.4 و 9.6 درصد در نمونه های دوده و نانو لوله کربنی و گرافیت منبسط شده افزایش داده است. به منظور افزایش مقاومت مکانیکی نمونه‌های پلیمری هادی از ده لایه پارچه کربنی تک جهته استفاده شده و نشان داده شد استفاده از الیاف کربن هدایت الکتریکی را به ترتیب 23.2، 27.3 و 24.7درصد برای نمونه های حاوی دوده ، گرافیت منبسط‌شده و نانولوله کربنی افزایش داده است. با استفاده از تصاویر تهیه شده به کمک میکروسکوپ الکترونی روبشی کیفیت توزیع نانو ذرات در نمونه‌ها بررسی شده است. The present research work was aimed at developing conductive polymer-based composites in order to have a higher conductivity than the standard level of the Energy Institute of America. In this case, the composites can be applied to make electrodes. For this purpose, carbon clack particles, carbon nanotube and expanded graphite with different weight percentages (5%, 10%, 15%, 25%, and 35%) were added to the epoxy resin and the electrical conductivity of the samples was measured according to the four-point standard method. The average electrical conductivity threshold for carbon clack particles, carbon nanotube and expanded graphite was determined at 25, 10, and 15, respectively. Furthermore, the effect of different construction parameters such as the use of vacuum pumps and heating on the electrical conductivity of the composite samples was also investigated. The experiments revealed that the use of the vacuum pump increased the electrical conductivity by 10.8%, 11.4% and 9.6% in carbon black, carbon nanotube, and expanded graphite samples, respectively. In order to increase the mechanical strength of the conductive polymer samples, ten layers of unidirectional carbon fabric were used. The results obtained showed that the use of carbon fibers enhanced the electrical conductivity by 23.2%, 27.3%, and 24.7% for carbon black, expanded graphite, and carbon nanotube samples, respectively. Ultimately, using the scanned electron microscopy images, the quality of the nanoparticle distribution in the samples was investigated. Kakati, B. K. and Deka, D. "Differences in Physico-Mechanical Behaviors of Resol(e) and Novolac Type Phenolic Resin Based Composite Bipolar Plate for Proton Exchange Membrane (PEM) fuel cell". Electrochim Acta No.52, pp.7330–7336, 2007. Du, L. and Jana, S. C. "Highly Conductive Epoxy/Graphite Composites for Bipolar Plates in Proton Exchange Membrane Fuel Cells". J Power Sources Vol. 172, No. 2, pp. 734–741, 2007. Johnson, B. a. "Thermally and Electrically Conductive Polypropylene Based Resins for Fuel Cell Bipolar Plates (Most important refrence on Temp limits)". 2009. Gholami, H., Shakeri, A. & Moosavi, S. H. "Preparation and Properties Investigation of Conductive Polyaniline-Zinc Oxide Nanocomposites". 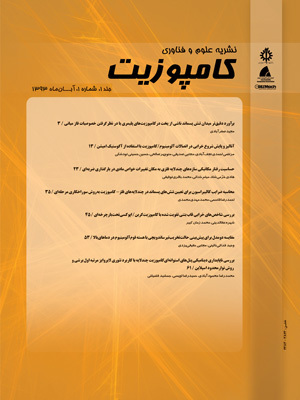 In Persian, Journal of Science and Technology of Composites Vol. 2, No. 1, pp. 7–12, 2015. Chen, S., Bourell, D. L. and Wood, K. L. "Fabrication of PEM Fuel Cell Bipolar Plates by Indirect SLS". Proc Solid Free Fabr Symp , pp. 244–256, 2004. Shen, C. hui, Mu, P. and Yuan, R. zhang. "Sodium Silicate/Graphite Conductive Composite Bipolar Plates for Proton Exchange Membrane Fuel Cells". J Power Sources, Vol. 162, No. 1, pp. 460–463, 2006. Jin, J., Lin, Y., Song, M., Gui, C. and Leesirisan, S. "Enhancing the Electrical Conductivity of Polymer Composites". Eur Polym J No.21, PP.992-1000, 2013. Dweiri, R. and Sahari, J. "Computer Ssimulation of Electrical Conductivity of Graphite-Based Polypropylene Composites Based on Digital Image Analysis". J Mater Sci. No.42. PP.10098-10102, 2007. Hsiao, M.-C. "Electrical and Thermal Conductivities of Novel Metal Mesh Hybrid Polymer Composite Bipolar Plates for Proton Exchange Membrane Fuel Cells". J Power Sources No. 195, Pp. 509-515,2010. Liao, S. H. "Preparation and Properties of Carbon Nanotube-Reinforced Vinyl Ester/Nanocomposite Bipolar Plates for Polymer Electrolyte Membrane Fuel Cells". J Power Sources Vol. 176, No. 1, pp. 175–182, 2008. Liao, S. H. "Novel Functionalized Carbon Nanotubes as Cross-Links Reinforced Vinyl Ester/Nanocomposite Bipolar Plates for Polymer Electrolyte Membrane Fuel Cells". in Journal of Power Sources No. 195, PP. 7808-7817, 2010. Sun, L. Q. "LiFePO4 as an Optimum Power Cell Material". J Power Sources No 189, PP. 522-526, 2009. Park, S. M. Jung, D. H. Kim, S. K. Lim, S. Peck, D, and Hong ,W.,. "The Effect of Vapor-Grown Carbon Fiber as an Additive to the Catalyst Layer on the Performance of a Direct Methanol Fuel Cell". Electrochim Acta , Vol. 54, No. 11, pp. 3066–3072, 2009. Bourell, D. L., Leu, M. C., Chakravarthy, K., Guo, N. and Alayavalli, K. "Graphite-based Indirect Laser Sintered Fuel Cell Bipolar Plates Containing Carbon Fiber Additions". CIRP Ann - Manuf Technol No.60, PP.275-278, 2011. Guo, N. and Leu, M. C. "Effect of Different Graphite Materials on the Electrical Conductivity and Flexural Strength of Bipolar Plates Fabricated Using Selective Laser Sintering". Int J Hydrogen Energy No 37 ,PP. 3558-3566, 2012. Taherian, R., Hadianfard, M. J. and Golikand, A. N. "Manufacture of a Polymer-Based Carbon Nanocomposite as Bipolar Plate of Proton Exchange Membrane Fuel Cells". Material Design NO.49,PP.242-251, 2013. Taherian, R., Golikand, A. N. and Hadianfard, M. J. "The effect of Mold Pressing Pressure and Composition on Properties of Nanocomposite Bipolar Plate for Proton Exchange Membrane Fuel Cell". Material Design No.32,PP.3883-3892, 2011. Taherian, R. A "Review of Composite and Metallic Bipolar Plates in Proton Exchange Membrane Fuel Cell: Materials, fabrication, and material selection". J Power Sources. No.265PP.370-390, 2014. Modarresi-alam, A. R." Preparation of New Conductive Nanocomposites of Polyaniline and Silica under Solid-State Condition". In Persian Iranian Journal of PolymerScience and Technology, No.29, PP.387–398, 2016. Rhodes, S. M., Higgins, B., Xu, Y. & Brittain, W. J. "Hyperbranched Polyol/Carbon Nanofiber Composites". Polymer (Guildf) , Vol. 48, No. 6, pp. 1500–1509, 2007. Barton, R. L., Keith, J. M. and King, J. A. "Development and Modeling of Electrically Conductive Carbon Filled Liquid Crystal Polymer Composites for Fuel Cell Bipolar Plate Applications". in Journal of New Materials for Electrochemical Systems. No.180,PP.368-379, 2007. Mighri, F., Huneault, M. A. and Champagne, M. F. "Electrically Conductive Thermoplastic Blends for Injection and Compression Molding of Bipolar Plates in the Fuel Cell Application". Polym Eng Sci No. 44, pp.1455-1465, 2004. Wang, Y. "Conductive Thermoplastic Composite Blends for Flow Field Plates for Use in Polymer Electrolyte Membrane Fuel Cells (PEMFC)in Chemical Engineering ",Waterloo Uni, 2002. Kakati, B. K., Sathiyamoorthy, D. and Verma, A. "Electrochemical and Mechanical Behavior of Carbon Composite Bipolar Plate for Fuel Cell". Int J Hydrogen Energy No.5, pp.484-494, 2010. Du, L. and Jana, S. C. "Hygrothermal Effects on Properties of Highly Conductive Epoxy/Graphite Composites for Applications as Bipolar Plates". J Power Sources. No 182, PP. 223-229, 2008. Shokrieh, M. M., Esmkhani, M., Vahedi, F. and Shahverdi, H. R. "Improvement of Mechanical and Electrical Properties of Epoxy Resin with Carbon Nanofibers". In Persian Iran Polym J , Vol. 22, No. 10, pp. 721–727, 2013. Mokarrar Industrial Group. http://mokarrar.com/en. available in 4 September 2018. Shimimarket. http://www.shimimarket.com/. available in: 4 September 2018. Song, L. N., Xiao, M., Li, X. H. and Meng, Y. Z. "Short Carbon Fiber Reinforced Electrically Conductive Aromatic Polydisulfide/Expanded Graphite Nanocomposites". Mater Chem Phys , Vol. 93, No. 1, pp. 122–128, 2005. Celzard, A., Marêché, J. F., Furdin, G. and Puricelli, S. "Electrical Conductivity of Anisotropic Expanded Graphite-Based Monoliths". J Phys D Appl Phys. No.33,PP.3094-3101, 2000. Zheng, W., Wong, S. C. & Sue, H. J. "Transport Behavior of PMMA/Expanded Graphite Nanocomposites". Polymer (Guildf) , Vol. 43, No. 25, pp. 6767–6773, 2002. The, G. and Eg, T. "Novel Electrically Conductive Polypropylene / Graphite Nanocomposites". October , pp. 213–214, 2002. Pan, Y. X., Yu, Z. Z., Ou, Y. C. & Hu, G. H. "New Process of Fabricating Electrically Conducting Nylon 6/Graphite Nanocomposites via Intercalation Polymerization". J Polym Sci Part B Polym Phys .No.38, PP.1628-1633,2000. Chen, G. H., Wu, D. J., Weng, W. G. & Yan, W. L. "Preparation of Polymer/Graphite Conducting Nanocomposite by Intercalation Polymerization". J Appl Polym Sci Vol. 82, No. 10, pp. 2506–2513, 2001. Antunes, R. A., De Oliveira, M. C. L., Ett, G. and Ett, V. Carbon "Materials in Composite Bipolar Plates for Polymer Electrolyte Membrane Fuel Cells: A review of the main challenges to improve electrical performance". J Power Sources No.196. Pp.2945-2961, 2011. Karimi, M., Ghjar, R. and Montazeri, A. "Investigation of Nanotubes ’ Length and their Agglomeration Effects on the Elastoplastic Behavior of Polymer-Based Nanocomposites. In Persian", Journal of Science and Technology of Composites No4, PP 229–240 ,2017. Umasankar, Y. and Chen, S. M. "Multi-Walled Carbon Nanotubes with Poly(Methylene Blue) Composite Film for the Enhancement and Separation of Electroanalytical Responses of Catecholamine and Ascorbic Acid". Sensors Actuators, B Chem No.130, PP.739-749, 2008. TORAYCA® | TORAY. http://www.torayca.com/en/. available in: 4 September 2018. Wafers, S. "Sheet Resistance of Thin Metallic Films With a Collinear Four-Probe Array 1". Measurement 98, PP 1–4 , 2003. Janesch, J. Two-Wire vs. "Four-Wire Resistance Measurements: which Configuration Makes Sense for your Application". No. May, pp. 1–3, 2013. Standard Test Methods for Constituent Content of Composite Materials. Annual Book of ASTM Standard. D3171. 2010. Hosseini, Hadi , Kokabi, "Mehrdad and Golshan Ebrahimi, Nadereh . Vertical Electrospinning of UHMWPE/ZnO Nanocomposite Fibers at High Temperature", In Persian Iranian Journal of PolymerScience and Technology, Vol. 27, No. 2, PP131-141, 2014.